Looking for advice, $2100 to spend on first scope. Matt do you know, or anyone, is the HD (flourite) is the same technology in Zeiss Victory FL? I was hoping to get some replies on my previous post. Im close to getting a Swaro z6 2.5-25 in either 44 or 56, with the ballistic turret. Do you agree 15x is plenty of power? Z5 only because of the saving.. They are actually close in legnth. The 56 is 22,4oz and the 44 is 19.6. We work on our baby the same way, striving for maximum performace. My Z6 has mil adjustments not MOA. Its just a different measuring system correct? Would you rather have moa? You think the z6 in 56mm will fit/mount nice on the Sako a7? Yup, 1/4 MOA is more fine of a measurement that 1/10 mil. 56mm is bigger than I would ever have unless it was a night hunting rifle. I prefer 40mm for my scopes, they are just more compact and have less weight. I have one with 50mm. But if I had a high power scope like you are considering, I would go 50mm but not bigger. Thats just my preference. As far as making a choice between mil based clicks and moa based clicks you need to take the reticle into consideration. If you have a mildot reticle it makes huge sense to have mil based clicks because you can make corrections like 3.5 mil simply by dialing in .5 and holding on the third mil dot below center. What I find with the FFP 3-9x42 Super Sniper is that at 3x the reticle is incredibly fine and at 9x it is about what one would expect a second focal plane 3-9 to look like. One of the reasons to go with a FFP is that as the sun goes down and there is less light you usually need to dial the power of the scope down to a lower power to have a brighter more useable image through the scope. To understand this take any variable scope outside in low light and compare how it looks at 6x or lower compared to how it looks at max power. 42mm divided by 6 power gives a 7mm exit eye pupil which is as bright as you can use. 50 mm divided by 7 power gives a 7mm exit eye pupil and with a 56 mm objective 8 power gives a 7mm exit eye pupil. At higher powers the image can look grey in low light it may still be useable buy it may not also. 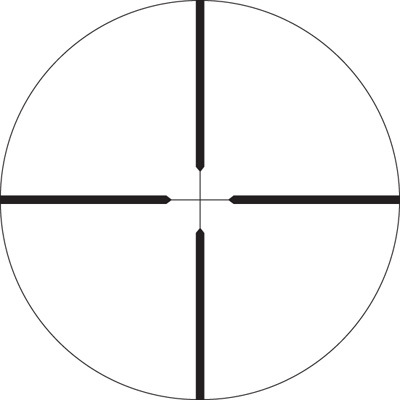 Balistic reticles in the second focal plane with high magnification scopes with a top end like 20x may work great in bright light but when the sun goes down and the deer come out if you cant use 20x your balistic reticle will not be on target except the center of the crosshair so the known distance hold over points wont work for you. With any system where you dial in correction and use the center of the crosshair that system is not handicapped by what power you have the scope on. Dialing in correction always works and is the most consistent way to shoot long range. Tactical knobs vary greatly in their look and size and some hunting scopes have smaller more hunting friendly knobs but the idea remains the same and if the reticle is not mil based who cares if the clicks are mil or moa you just want the right number to hit the target at a known distance. The BALISTIC TURRET is a really good system for hunting. giving up 1.5x on the low end to add 7x on the high end seems like a good trade off to me plus you go to 50mm which I like where 56 seems a little clumsy. These are great choices. Both utilize flourite in the objective glass to improve image quality. Same? I don't know, but certainly similar. The wisdom is much appreciated! How does the z6 2.5x15x44 stack up? Im wondering why the light transmission of the z5 52mm has light transmission >90, and the z6 is 90? Its not a maintube difference? HD (flourite) coating maybe? My guess would be the Z6 since it has a different magnifivation ratio has another lens or two in it that is lowering the number. I would not worry about it though, I highly doubt a human eye will be able to tell that small of a difference. Just pick the one that has the other specs that meet your needs the best. Now Im on the scope mounting hunt! Im guessing with a 44mm obj. that I can look for low or med depending on the manufacturer. Thanks you guys, shoot safe! Yeah, low to medium should work. My Abolt has low talley with the 42mm objective and there is still plenty of room. You've received excellent advice. If you're willing to drop that kind of money on your first scope, you might as well go first class and get one you'll enjoy for the rest of your life! It's hard to beat the Z6 as an all-around, go anywhere hunting scope, and with the prices on the Sample List, you will have money left over for other goodies like some good mounts. Needless to say, they are outstanding scopes, but the same can be said about the Zeiss Victory, Leica ER, and S&B Zenith! Of the Z6's, personally like the 1.7-10X42 from the standpoint of size vs. magnification range, but all of them are superb. I just don't happen to like huge scopes and gigantic objectives on top of my BG hunting rifles when 10X is all the upper magnification I ever need for any critter weighing over 100 lbs, anywhere I ever hunt.